It flabbergasts me that we went through the whole Y2K crisis, and narrowly avoided severe disruptions in our society thanks the hard work of many, many people, and yet some people seem to have learned nothing from it. I encountered this date on something today: “09-12-10”. What the hell is that supposed to be? It’s meaningless. MEANINGLESS. Starting today, write all of your dates like this: 2010-12-22. YYYY-MM-DD. Year-Month-Day. Do it. Don’t argue with me. Just shut up and do it. Fun fact! Writer Richard Suflet recommended drinking large doses of strong vinegar with fleas to cure the illnesses that resulted from swallowing the horse-leeches that were common in drinking water. Enjoy some old-school psychedelic goth-industrial rock with an assortment of clips from films that will be familiar to MST3K fans. Try not to knock over any furniture. Gotta love the latex fetish coveralls. I am taking a break from my effort to watch every DVD we own in more or less alphabetical order (currently on “C”), and viewing Frankenhooker. This is a funny horror movie from the golden age of VHS, released on DVD in widescreen. What I love about this movie is the mumbling, New Jersey-accented Jeffrey Franken, electrician and part-time mad scientist, whose bizarre activities are mostly ignored by his friends and family. Mother: Oh, Jeffrey. I’m worried about you. Mother: Do you want a sandwich? I am also working on a paper for my Criminology class. This seems appropriate. This blog was created more or less as a joke: a place to complain about the inane and ludicrous things that annoy me, so that I could get on with my life. Overhyped movies, governmental stupidity, human frailty… it’s easy to get caught up in the irritations of life. However, despite what this web site might lead you to believe, I am, by nature, not an angry or bitter person. I prefer to be upbeat and optimistic. Life is too short to be pissed off all the time. The love of my life, who makes me a better person through her example. My mother, for raising myself and my sisters to be relatively sane, relatively responsible adults. My sisters and sisters-in-law, for raising children who might make their generation something worth celebrating some day. That I am warm in the winter, cool in the summer, and dry when it rains. Water that is abundant, inexpensive, and clean. Work that I genuinely enjoy. That the worst thing I realistically have to fear while traveling is being treated disrespectfully by a TSA flunkie. That the people who staff our government are usually too busy fighting each other to pay much attention to the rest of us. That I am so wealthy that I can throw socks away rather than darning them, and not even think about it. That I still have friends, despite my boorish and inconsiderate nature. That I am not as boorish and inconsiderate as I once was. Medical care that is effective, inexpensive, and widely available. That I have traveled beyond the horizon in all four directions. This is proof that Americans have become weak and stupid. A CBS News poll found that 81 percent of Americans approved of full-body scanners, 15 percent were opposed and 4 percent were undecided. Disgusting. Simply disgusting. I am embarrassed for people so meek, brain-dead, and lacking even a basic sense of human dignity that they accept this abuse. The TSA “security theatre” crossed the line from inconvenient to unacceptable a few years ago, when they started demanding that people take off their shoes. This… offense… is so far over the line that anyone who chooses to go along with it for any but the most compelling reasons (work, family illness, etc.) doesn’t even deserve to be called “human” anymore. And the people who impose this nightmare on The Land Of The Free? I won’t call them what they deserve to be called: minors sometimes read this blog. What’s an eleven letter word for “dull”? It’s a trick question, of course, since the answer is two words. Just saw Harry Potter with some friends (it was our third choice, but the only movie that started at a convenient time). Have you spent a long weekend camping with three dull people? Then you have seen the new Harry Potter movie. What can you say about a movie where the worst thing the villain does is give a bad dinner party. Comments Off on What’s an eleven letter word for “dull”? That’s what I expect. When it comes out on DVD, I will find out if I was right. This is a fourteen minute film about Sal Giunta, the first person since Vietnam to be awarded the medal of honor. When people say, “Oppose the war, but support the troops,” this is what they are talking about. Sergeant Giunta is not to blame for US troops being in Iraq and Afghanistan: pencil-pushers in Washington, D.C. are to blame for that. You and I are to blame for that, because not enough of us have stood up and told our politicians to bring these brave young people home now, damn it. Sergant Giunta and the brave young men and women who fight and die in third-world hellholes on the other side of the planet deserve our respect. The self-serving cretins who sent them there, and who keep them there, do not. This is my niece, Makayla. I think this is pretty amazing. When I was her age, I never did anything like this. When Makayla Heintz, 11, learned the Breast and Cervical Cancer Program at Harbor Hospital diagnosed her grandmother with breast cancer, she decided she wanted to make a difference. She started a lemonade stand and raised nearly $70. At Harbor’s 1903 Society Reception, Heintz presented the profits to Harbor Hospital President Dennis Pullin. That evening, Dennis and Angela Pullin offered a special challenge — they each matched Heintz’s donation and invited others to do the same. Heintz’s story has motivated others to give, creating Makayla’s Challenge. Donations made as part of this challenge will be used toward the purchase of a blanket warmer for the Oncology department and to set up an emergency fund for oncology patients in need. It is not too late to participate in Makayla’s Challenge by giving $70 or more. Donations are being accepted in the Philanthropy department by cash, check or credit card. 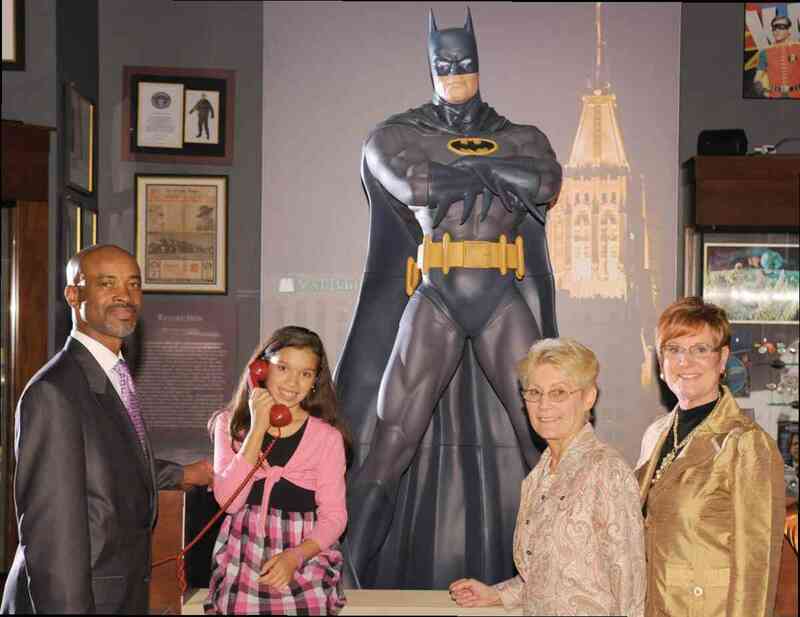 I am not sure what’s up with the Batman museum, though.